From higher elevation sites in Argentina that’s shipped to California for blending, the 2016 Red Blend (70% Cabernet Sauvignon and 30% Malbec) offers lots of spice-box, dried red and black fruits, earth and tobacco leaf like aromas and flavors. Medium-bodied, supple, polished and silky, with plenty of character, drink it over the coming couple of years. 2,641 cases. 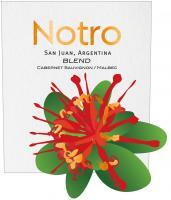 Inspired by the beautiful (and striking) Andean flower of the same name, Notro wines are vibrant, fruit-forward offerings that retain the indelible character of their high-altitude origins in Argentina’s premier winegrowing areas. Tasting Notes: Offers a mix of ripe, red and dark fruit aromas, with hints of red currants and violets. This open-knit medium weight wine is full of instantly pleasing red fruits, the sturdy structure of Cabernet allied with the lushness of Malbec, with a long, clean finish. Serve With: A versatile wine that will complement most meals, including pizza, pasta, red and white meat dishes, and more. New Gin from 4 Hands!